What better birthday present for a President who has overseen the greatest growth of government since FDR than a stock market in absolute free fall? Unless you’re Paul Krugman – who really ought to give back his Nobel prize by now – you’ve no doubt noticed that the 44th President of the United States has been about as helpful to the US economy as a tennis racket on a golf course (not very). Worries about the state of the economy in the U.S. and around the world slammed stocks on Thursday, driving the Dow Jones industrial average to close down more than 500 points. It was the Dow’s worst drop since October 2008. As President Obama celebrates his 50th birthday party, millions of unemployed Americans are asking what happened to all those “shovel-ready” jobs he promised during the stimulus debate? And what about the 400,000 jobs that were promised if we passed the Health Care bill? And, of course, what about the now infamous chart the White House produced predicting that the unemployment rate would never climb higher than 8% with his massive stimulus? What Jon Stewart and other armchair liberal economists ignore is that Conservatives don’t argue against government existence itself. Rather, Conservatives – yes, even those wacky Tea Partiers – are pointing out that the government doesn’t actually have any money. It never has and it never will. Every single cent the government spends comes from my pocket, your pocket and your neighbors pocket. So every dollar they spend is a dollar that you and I can’t spend on something we need (like gas, for those of us who enjoy driving to places). Of course government has necessary functions like defense, police, paving roads and issuing basic regulations in order to create a level playing field and consistency in the marketplace. But don’t tell me that the government has ever been a more responsible investor in anything than you and me, the people who actually earned the money the government loves to take. It has nothing to do with “rich” and “poor.” It has to do with competence, first and foremost. Well, it should still be pointed out that the top 5% of income earners (the so-called “rich”) pay over 60% of the tax burden. And, more than 40% of Americans pay no income tax at all. So when President Obama talks about “spreading the wealth around” or Paul Krugman assails the rich for supposedly not paying their “fair share”… I can only ask, what would their fair share be?? The fact is, Obama’s “recovery” has been anything but. Basically every single promise Obama and his economic team of wunderkinds has made regarding jobs and the economy has been utter BS. 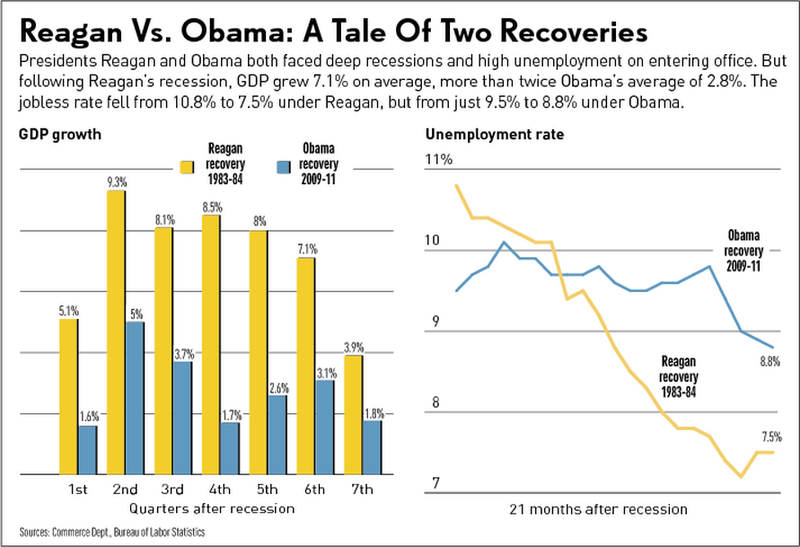 And before I hear the “but he inherited such a mess!” arguments, let’s compare Obama’s “recovery” to Reagan’s, when the situation was FAR more dire than in 2009 when Obama took office. If you recall, President Carter left Reagan a nightmare of stagflation – super high inflation and even worse unemployment. So what happened because of Reagan’s policies? After the end of the ’81–’82 recession unemployment fell sharply as growth expanded dramatically. Twenty-seven months after the official end of that recession, unemployment had fallen to 7.5 percent from a peak of 10.8 percent. At the same point after the recent recession, unemployment had fallen not 3.3 percentage points, but only 1.4 percentage points. The reason is not hard to find. In the seven quarters following the ’81–’82 recession, GDP growth averaged 7.1 percent (on an annual basis). In the current post-recession span it has averaged only 2.8 percent. We need 2.5 percent growth just to absorb increases in the work force. The first quarter of 2011 had only a 1.8 percent increase in GDP. The tax burden decreased, freeing up business to keep their hard-earned money and do what they do best: employ people. The government doesn’t do a very good job of employing people since every job they “create” comes at the expense of private sector funds that could have been used to invest in more efficiency and innovation, leading to a net greater creation of private sector jobs. Reagan’s recovery is beating Obama’s by more than 15 million jobs at the same point in time after the respective recessions ended. That’s amazing. Reagan inherited a much worse situation and improved it swiftly and significantly. Obama’s policies have done… not so much. Compare the two worst post-World War II recessions. Both the 1981-82 and the 2007-09 downturns were long (16 months and 18 months, respectively) and painful (unemployment peaked at 10.8% in 1981-82 and 10.1% in the last one). What’s dramatically different, however, is how each president responded. Obama massively increased spending, vastly expanded the regulatory state, and pushed through a government takeover of health care. What’s more, he constantly browbeats industry leaders, talks about the failings of the marketplace and endlessly advocates higher taxes on the most productive parts of the economy. Unemployment. Under Reagan, the unemployment rate had fallen to 7.5% by this point in the recovery. Under Obama, it’s still stuck at 8.8%. Long-term unemployment. There were far fewer long-term unemployed by this point in the Reagan recovery; just 18% of the unemployed had been without a job 27 weeks or more. Under Obama, that figure is an astonishing 45%. Consumer confidence. By this point in the Reagan recovery, the Conference Board’s Consumer Confidence Index had hit 100. Today, the index stands at just 65.4. Deficits. Under Reagan, the federal deficit was trimmed to 4.8% of GDP by 1984. Under Obama, the deficit is expected to climb to 10.9% of GDP this year. Obama and his defenders like to say he inherited the worst downturn since the Great Depression and that things would have been worse still had he not acted. But the recession was almost over by the time he took office — and officially over just six months after that. Bottom line, my nephew could more adeptly run the White House than President Obama. At least he wouldn’t promise everything under the sun and then sit back and blame everyone and their mother for his problems. Reagan led. Obama complains. Reagan was positive. Obama is a negative, annoying crybaby. Reagan fostered a new era of prosperity that led to him winning 49 states in 1984. Obama has fostered a new era of government dependence and irrational class warfare that has pissed everyone off (especially the disenfranchised folks who so applauded Obama’s meteoric rise) and achieved absolutely nothing.